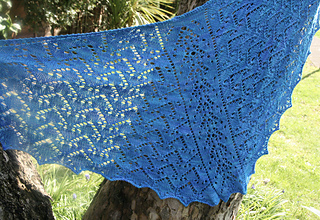 The third pattern in the Affirmation collection, the Believe and Focus shawlette combines two original lace stitch patterns derived from the words Believe, on the central spine, and Focus, on the side panels. The shawlette is worked from the top down beginning with a garter tab. 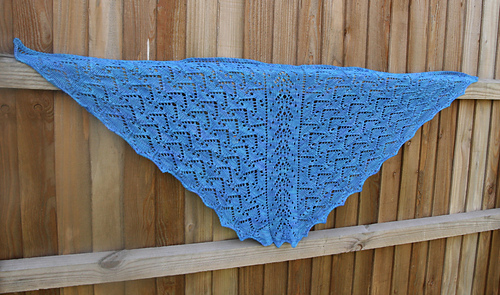 After blocking, the finished shawlette measures 21” (53.3cm) deep at the centre with a 52½” (133.3cm) wingspan when worked to pattern tension. This is easiest measured over one pattern repeat of the Focus pattern, which should measure 2¾” (7cm) wide and 3” (7.6cm) high after blocking. Achieving exact pattern tension is not vital but it may affect the finished size of your shawlette and the yarn yardage required if you do not. 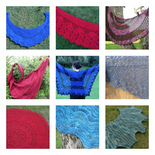 The lace stitch patterns are both charted and written. 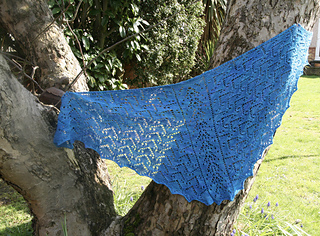 It is NOT necessary to work from charts in order to make this shawlette.